A few weeks ago Ash was pulling in to work when she saw something out of the ordinary. A man crossed in front of her, obviously working out but in a way she had never seen before. He wasn’t jogging and he wasn’t on roller blades. Instead, he appeared to be hopping…in moon boots. Naturally, Ash whipped out her phone (She was parked at this point. Safety first, kids…) and sent a picture to Chris. It turned out that the man was wearing Kangoo Jumps boots. We hit the internet and decided that we needed to try it out! This is all fantastic but in addition to that it just looked freakin’ FUN. Since the internet is our friend, we found a GroupOn for Kangoo classes in Toronto. We purchased three classes for the introductory rate of $19. Dorina Rigo is the founder, distributor of Kangoo Jumps Toronto , and the club offers regular classes at the Yonge Street Fitness club in downtown Toronto. Classes offered are Kangoo Power, Kangoo Conditioning and Kangoo Bootcamp. You are able to pre-register for all Kangoo classes online to hold a spot and ensure boot availability. So, we did just that and headed down to Yonge and Isabella after work one evening for a sweat session of Kangoo Power. When we arrived at the gym , we were asked to fill out a contact form and leave a piece of identification at the front desk. Then we were given a towel and shown to the group exercise room. Dorina arrived a few minutes before class began , and gave us punch cards to use for our future classes. She was very nice and encouraging about our first Kangoo experience. Our teacher, Christina advised us to us this class to get used to the boots and not overdo it. Uh-oh. What did we get ourselves in to? When the class began it took a while to get our footing. We soon learned that it was easier to balance on the boots than we had initially thought. Also, it is A LOT easier to jump and bounce in the boots than it is to stand still! We also caught on that just as you thought you were going to tip over one way, if you tilt your feet in the other direction you are able to steady yourself very easily. Christina was a great teacher. She began with simple moves and then built them into an easy to follow choreographed routine that the class did together a number of times. The music was loud and got us pumped. And we can also say that we can do the Macarena in these boots! She came over to Chris (and a few others) to coach her along and give tips as she bounced, which showed she really cared about the group. Before we knew it, we were Kangoo-ing away. The hour class actually went by very quickly. You will sweat…a whole lot. Expect to be dripping my the end of the class. Try jumping up and down for an hour, you’ll see what we mean. Wear long, heavy socks. The Kangoo Jumps boots fit sort of like a rollerblade. Some people have complained about the top of the boot digging into their leg. Long socks will eliminate this issue. Bring water. You’ll need it. A lot of it. No need to be self-conscious. At first when we were literally shaking in our boots, we worried that we looked dumb. We quickly learned that no one cares because everyone is busy doing their own thing. Plus the mood of the class is fun, casual and encouraging anyway. It’s all in the breathing. Christina spoke with us afterwards and said once you can regulate your breathing, similar to if you’re running, it becomes easier to work out in the boots. Admittedly when it’s your first time doing this, this is not the easiest thing. 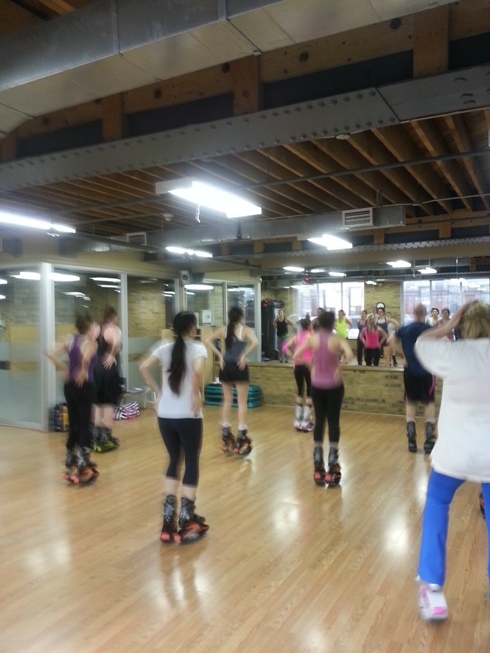 The Kangoo Jumps class ended up being a ton of fun. It definitely takes a while to get used to but once you’re off, you can’t stop. Although we had a great workout and sweat up a storm, we did not have any leg, joint, muscle soreness the next day. So, we think that the rebounding really does work to cushion impact. We will most definitely be returning for more Kangoo Jumps classes in the future. 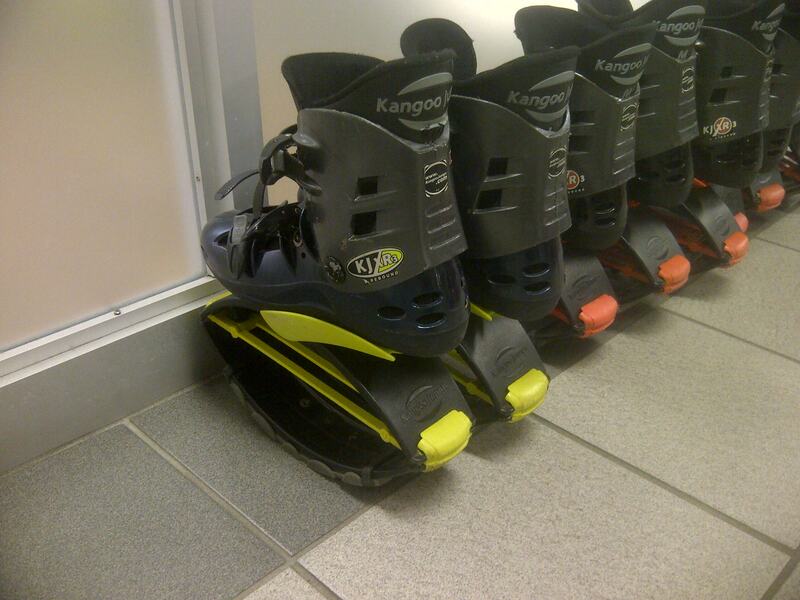 Have you tried Kangoo Jumps? I too am a Kangoo’er!! I Kangoo in London Ontario with Paula Martin our instructor. 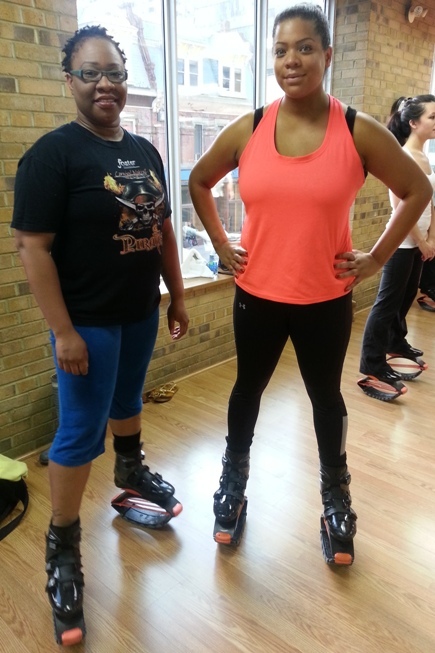 Reading this article brought back so many memories of my first experience with Kangoo Jumps. Initially, I thought that there was no way I could do a work out like Kangoo. 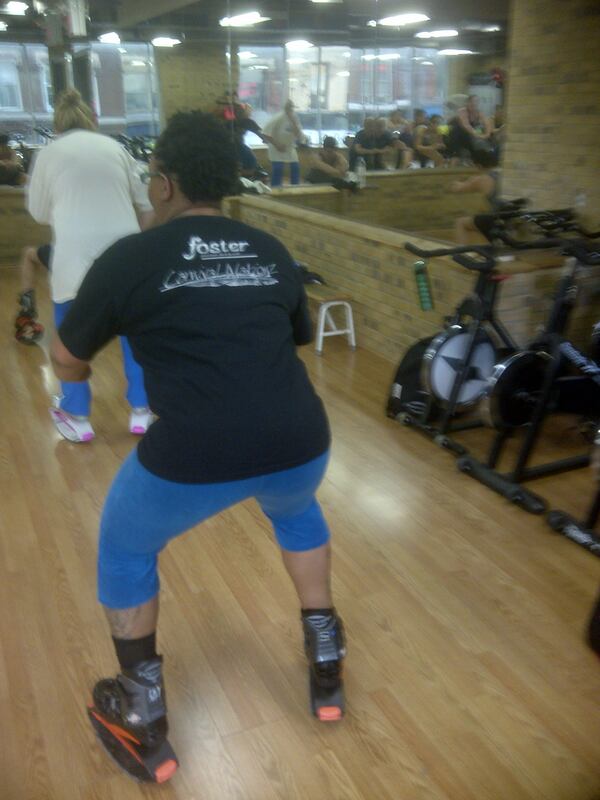 After my first class I was hooked and soon after I purchased my very own pair of Kangoo Jumps!! I encourage more people to try the classes!! They are such a fun way to lose weight, feel fit and tighten your entire body!! I have been a Kangoo’er for almost a year now and my goal is to run a 5k in them!! Looks like a lot of fun and I too could use a height booster … haha. Def something worth doing!!!!! Oh, this looks like so much fun! I have zero endurance so I stay far away from anything that involves running of jogging, but bouncing sounds like something I could do?! It is so cool and different. I’m glad to hear that it is such a great workout too. Thank you for another super fun post!